This level has medium difficulty. 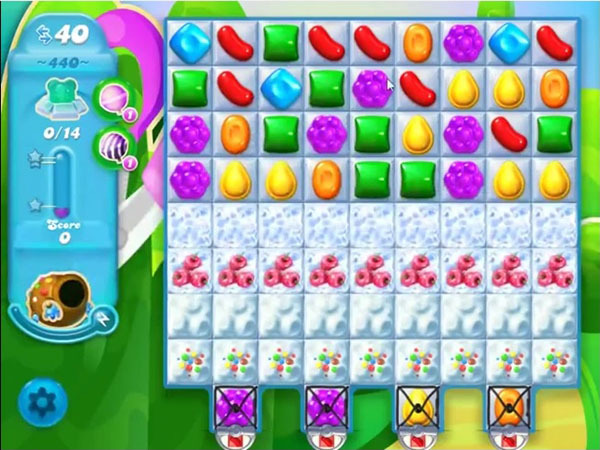 For this level try to play from top part of the board where more candies available to play and try to make special candy. Make striped candy and combine with colorbomb or wrapped candy to break the snow blockers that are in bottom. Or play near to snow blockers to break them to find the bears. You might need to make striped candy to break the snow blockers that are in bottom with single column. Hate this level been stucked there for over a month. Been stuck on this level for five months. Not fun anymore am giving up. It’s totally rigged and unfair. Cannot get through Soda Crush 440 without more available plays or extra color bombs added once in a while! More of a chore than It is pleasure. I’ll give it a couple more tries…then I’m out! !